Bookvip.com = scam! Beware! If anyone else books in a nearby city, same dates, they'll cancel your trip! Not worth the stress! BS company! 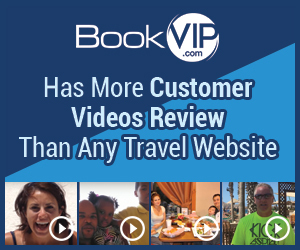 We had a bad start to our vacation because BookVIP.com called us 4 days before our trip and threatened to cancel our trip unless we paid them another $600-$1000! We told them that we could not pay that amount. They insisted that we were "group traveling" with another couple. We have no idea who these people are (that they kept insisting that we knew) and we kept telling BookVIP.com that. They said the hotel allows no group travel. We told them over and over again after several harassing phone calls and hours on the phone with them, that we were absolutely not group traveling! They said either we need to pay the additional fee, or the other couple needs to pay the difference or they are canceling both of our trips! After two whole days of dealing with this mess and a few stressful and sleepless nights, they told us that we were okay finally because the other couple ended up paying the fee. We couldn't believe what they put us through! Now this poor other couple had to pay the fee! Every time you call them, it usually disconnects the phone call. Finally someone from India will answer the phone and you wind up getting a different answer from each person you speak with. They keep blaming the hotel. The hotel blames them. BookVIP.com are the ones who advertise on Facebook and geo-target metropolitan areas. They were geo-targeting the Denver metro area. This other couple lives in Centennial Colorado, about 30 minutes from us. (Book VIP told us where they lived.) The other couple happened to book the same dates as us. Over Valentine's Day! So they automatically assumed we were group traveling! What a joke! Of course the odds of that happening are incredibly good! BookVIP.com was horrible and almost ruined our anniversary and entire vacation. I would beware of booking with them because if anyone else ends up booking in the same or nearby city as you, over the same dates, you might get the same incredibly stressful call over and over right before you are to go on your trip. Way too much stress. Not even worth it! I didn't like: Having my reservation cancled, Customer service. Review #595664 is a subjective opinion of AceNat.